My baby daughter, Guadalupe, is now 3 months old and growing like a weed. I love watching her evolve more and more into a person every day, smiling, grabbing, and following me with her eyes. One recent development that I haven’t exactly relished, however, is drooling. The girl is a drool machine! Within minutes of dressing her in an adorable onesie, a big wet stain seeps down the front. Not cute! I thought about adding a bib to her ensembles, but every one I tried made her look like she was ready to eat. I wasn’t looking for anything waterproof or heavy duty, just something to contain the flood! Then I remembered that when Whitney’s son was a drooly baby he wore a bandana all the time. I realize now that it’s the perfect solution! 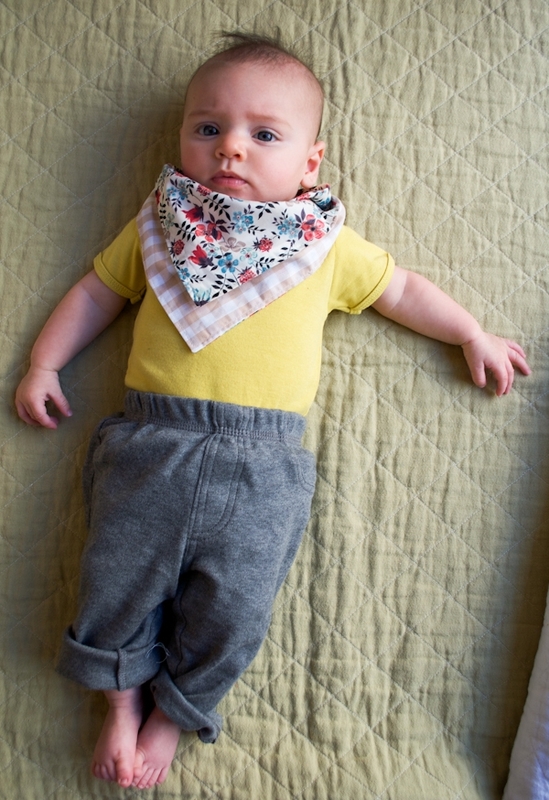 These Bandana Bibs are simple to make, easy to wear, and will make your baby look like the cutest little cowgirl (or boy) on the block! 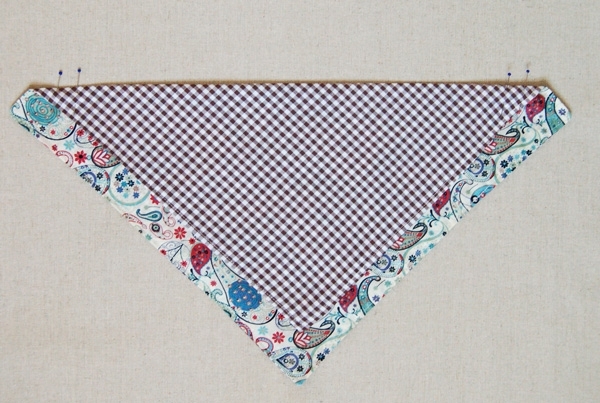 I made them with Kokka’s spunky small and large Gingham and elegant Liberty of London for a sweet bit of contrast. Best of all, they address the drooling issue in a playful and pretty way! Note: If you’d like to get less fabric you can get three identical bibs out of a 1/2-yard of outer fabric and a 1/2-yard of lining fabric. 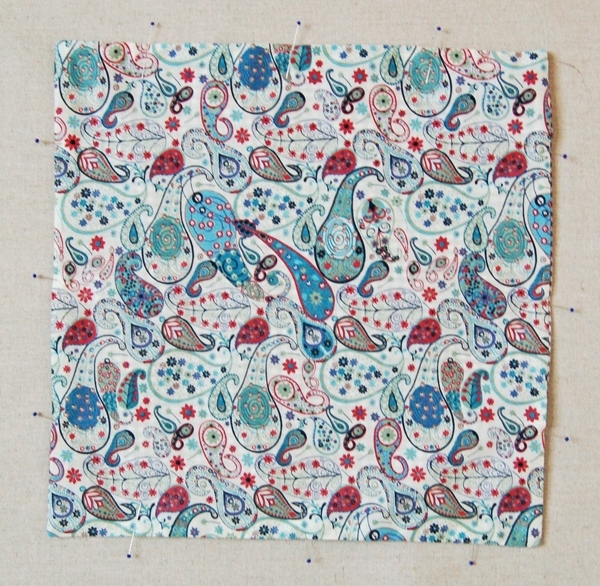 Cut a 13-inch square from the outer fabric and lining. Pin these squares right sides together. 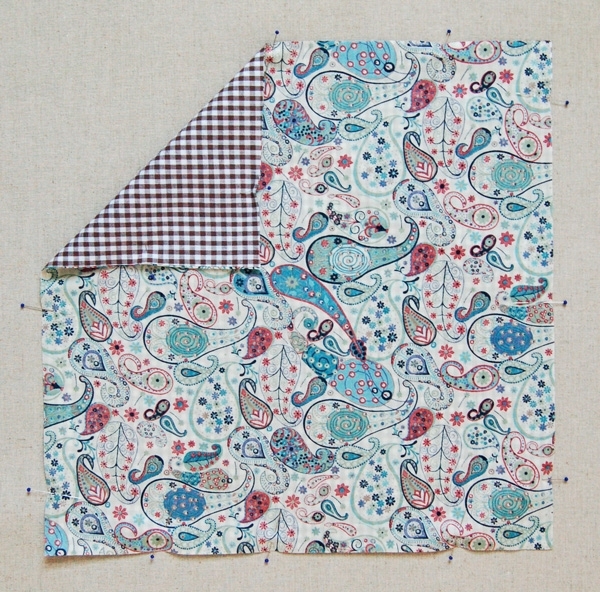 Sew the squares together along all four sides with a 1/2-inch seam allowance, leaving an un-sewn 3-inch gap in the middle of one side. Snip off the corners. Turn the piece right sides out through the gap. 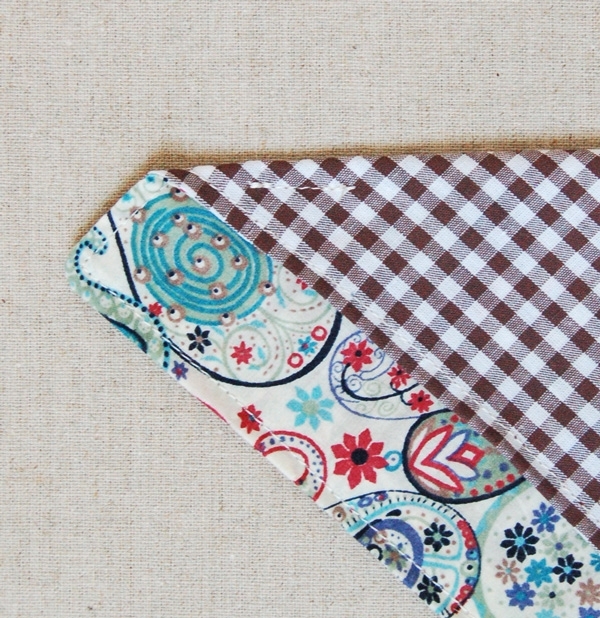 Press the square flat and pin the lining to the outer fabric along all four sides and across the gap. Edge stitch around all four sides. This will close the gap. 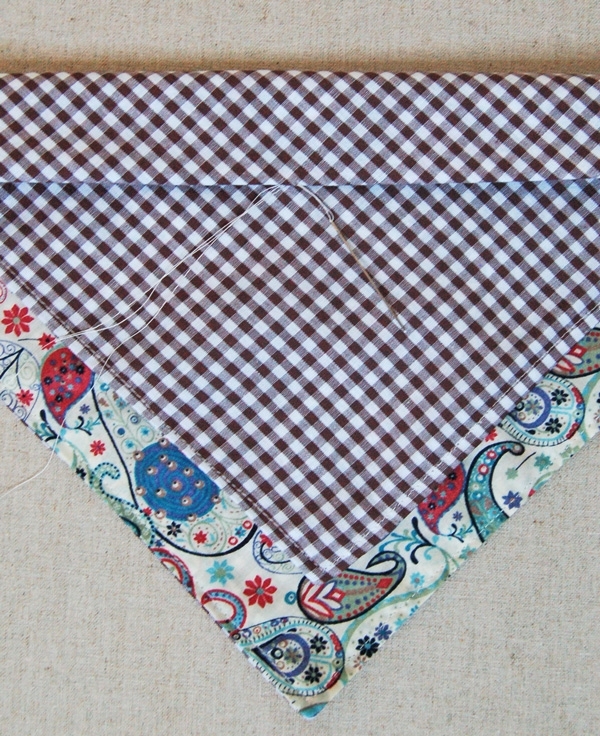 Orient the square diagonally with the lining facing up, then fold the top corner down 1-inch above the bottom corner so that 1-inch of the lining fabric shows, as pictured above. This is the right side of the bib and the point is the front of the bib. Pin all of the layers together along the top left and right sides of the top fold. Sew the fold down with a 1-inch long seam at the left and right sides 18-inch from the top fold. 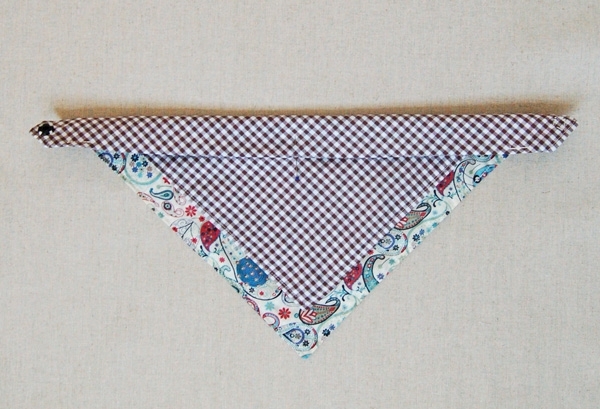 Hand sew the snap on at the left and right corners of the triangular shape. Make sure that it snaps closed neatly. Tack the fold into place by hand stitching a few stitches in place at the pinned point. Sew slightly towards the back of the fold to hide the stitches. Can I ask you if in the last step you hand sew an invisible stitch all the way or just at the center? Thank you. fantastic idea, thank you for sharing.. The last step is just at the center point, not all along the fold. Thank you for your question! Perhaps emphasize the snap. 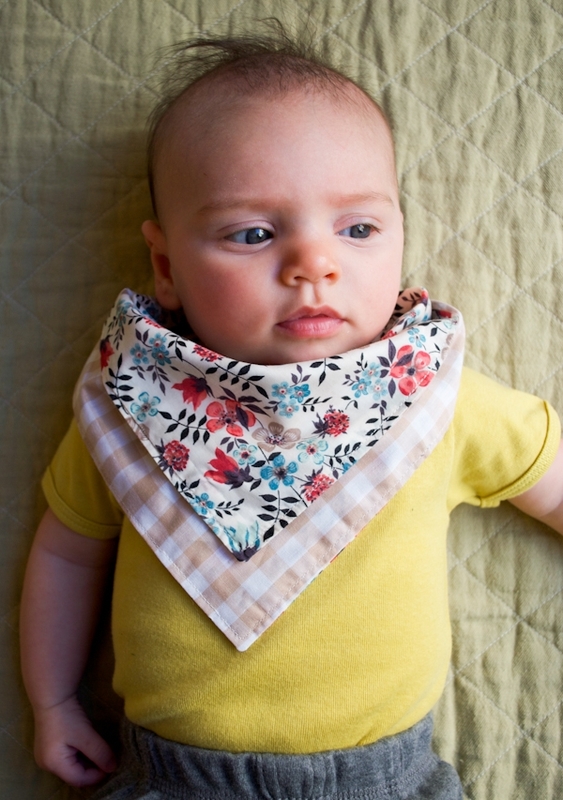 Some folks may be inclined to tie it and save a step–as in bandana–and this could mean a choking hazard for baby. Velgro would also be a safe solution. 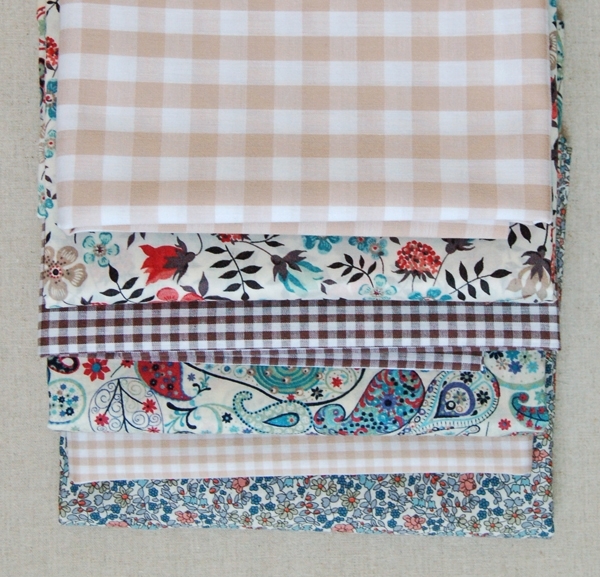 Beautiful fabric combinations–the neutrals with the prints. Thanks for the great idea. Very simple to make and perfect for my drooling 3 1/2 month old grandson. 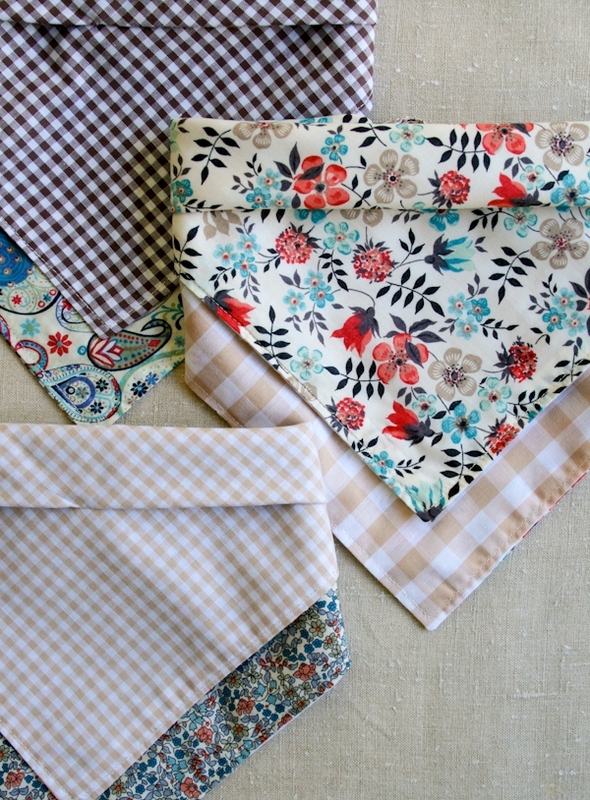 These bibs are much shorter, diagonally, than a regular bandana and aren't long enough to be tied. But thank you so much for your concern and for your kind words about the project and the baby! i love, love, love these! my drooler is 18 months…what size square would you use? I don't have an 18 month old to try it on so you might need to do some trouble shooting. Off the top of my head I think cutting 14 1/2 inch squares would probably work. It's a fairly loose fitting item so it doesn't have to be exact. Perfect timing! My 10 mth old is still drooling after about 7 mths, and I've been thinking about making / buying something like this, so thanks v much for the tutorial! I'll try the larger size you suggested, as he's v chubby! I have made one with 13'' vs 13'' and it fits my 3 year old son… it seems that i can make it smaller for younger babies… I will send you a link to the photo, ok? Your version looks adorable and it's good to know that the size is so adaptable. I really liked the loose fit on my baby because it made it seem more like a scarf and less like a traditional bib. But if you want it to be more snug you could make it smaller. You might want to try the original size because it does fit loose and as you can see from MJL's comment it can even fit a 3 year old! This is wicked cute! I'd like to sew up some cute 'n easy projects before babe comes. Thanks for the tutorial. Thanks for the pattern Molly, I have just made 3 this morning! My friend has a 6 month old and I am hoping these will do the trick as she starts to teeth. They're so much cuter than the simple one layer ones. Thanks! Hi 🙂 I am a huge fan of your site! The amount of times I have googled something to end up on The Purl Bee is staggering. I just wanted to say that your bibs are gorgeous and I have posted a link to this post on my site. I hope you don't mind. What is the purpose for folding it down an inch in the last/second to last step? Thanks! 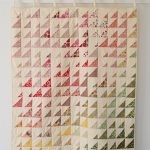 Looking forward to making some! 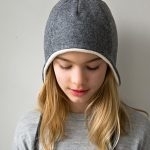 The little tuck in the front makes it dip down a bit at the chin and lay flater. You can see this effect most clearly in the second photo from the bottom. Lovely tutorial. I've made a couple so far, and it's definitely a pattern I'll be using again and again. Such a nice alternative to a traditional bib. What a fantastic tutorial. I really like how you have used two different types of fabric, it makes it really unique. J'adore votre blog, plein de superbes ralisations. Je vous remercie vivement pour vos partages gnreux. Oh wow. I am impressed by this idea. The model is too adorable. 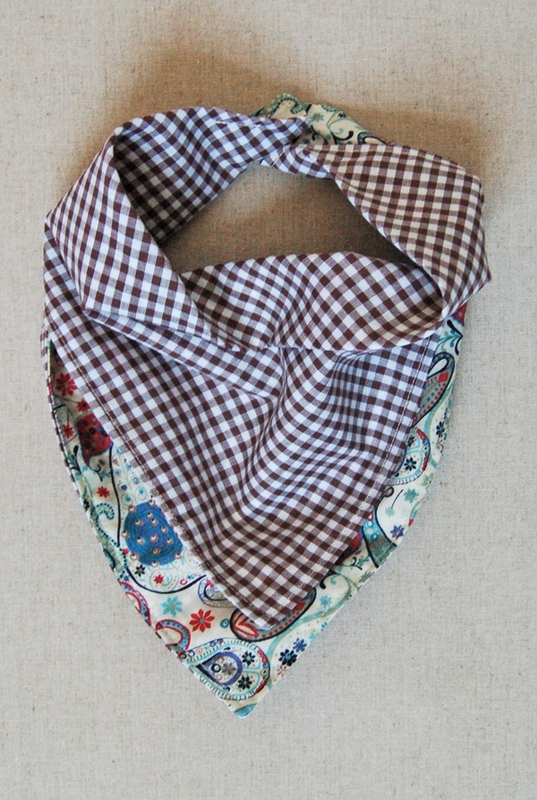 Thank you for the pattern for the bandana bib, i have just made one for my wee grandaughter as part of her christmas pressie. Love this! What is the best stitch to use if hand sewing? I would recommend using a small running stitch to sew these by hand. By far the best tutorial and best looking bandana bib I have seen. 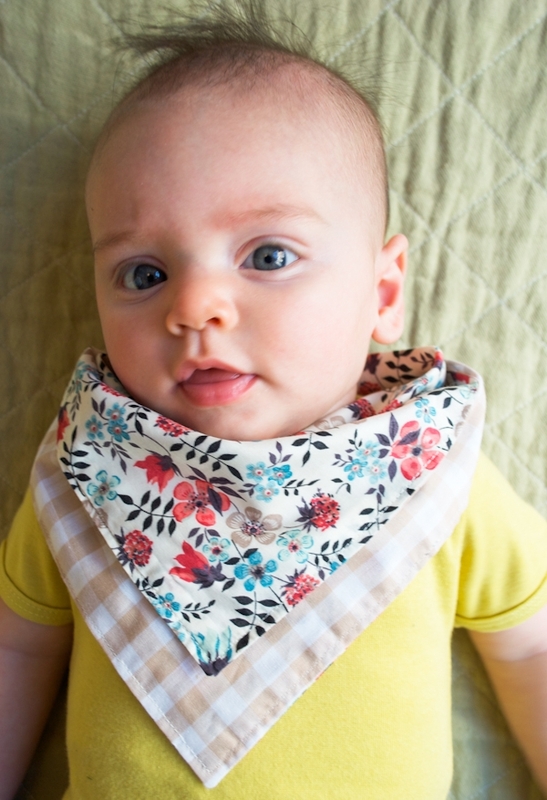 I love to mix patterns and the fact you can actually see both of them while the bib is being worn is great. These are on my sew list for tomorrow. EVERYONE I know is having or has had a baby. Thank you so much for sharing. I meant to ask in my previous comment to you. Have you tried lining the bibs with flannel or batting? I worry that they may seem too bulky. Have you or anyone else that has tried this bib experimented with that? I was planning on cutting my flannel about a 1/4″ shorter on all sides so the seams would lay flat. The top stitching and tacking it in the center when folded down should keep it in place nicely. Any thoughts on this? Thanks so much. I have not tried lining them with flannel but I think it would work great. I would actually suggest using flannel as one of the fabrics and not as an insert. Just make sure it’s 100% cotton so it’s nice and absorbent! 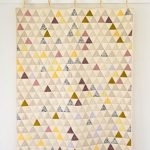 I love this fabric!! Such a cute idea! 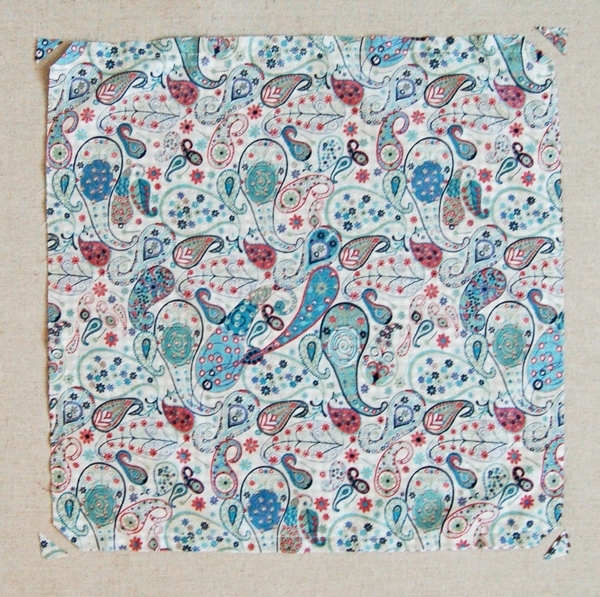 I love this pattern and fabric print! Such a gorgeous idea! I made the mistake of using fabric with a directional print and neglected to cut on the bias. The bibs were fine, but not as cute as they would have been cut properly. Live and learn! Very clear tutorial. 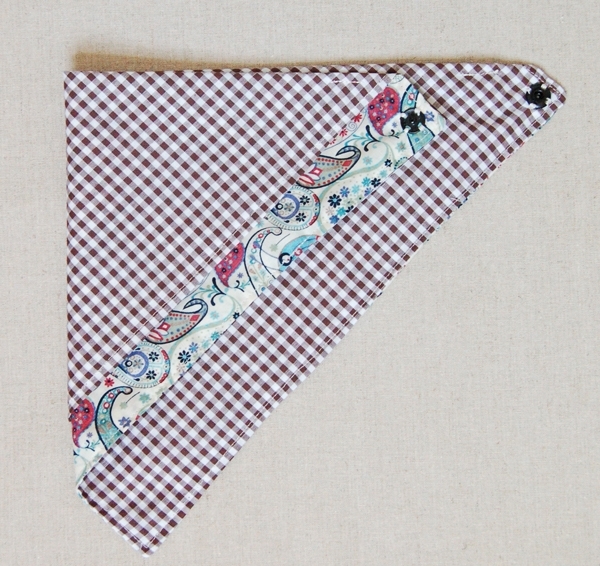 Came across your page while searching for bandana bibs. I am going to bookmark this page. 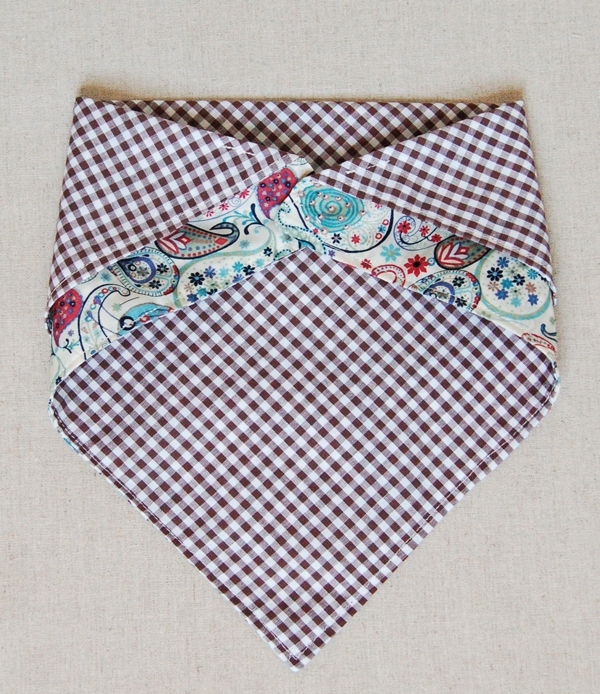 Bandana bibs are so versatile and a must have for bubs in my opinion. Great idea! It seems like a very easy task with your step by step guide!